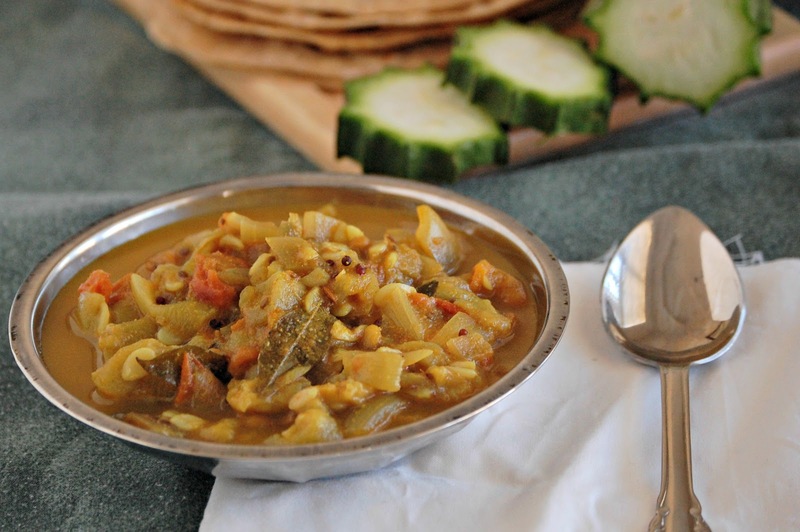 Here's a really simple and sweet tasting curry that makes a satisfying side dish for rotis. Wash and peel the gourds. You can save the peels and make a chutney out of it. Cut the gourds into 1 inch thick slices. Quarter these slices. Cut onions into 1 inch pieces. Chop tomatoes into one-eighths. In a small mixer jar, grind the ingredients listed under "to grind", with little or no water. In a heavy saute pan on medium high heat, add oil for sauteing. Before it starts smoking, add the ingredients listed under "Seasoning". When the mustard seeds start splattering, add the onions. Stir once or twice until the onions have turned translucent. Now add tomatoes, chillies and a little salt, to draw out moisture. 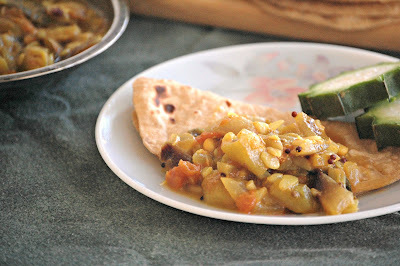 When the tomatoes are cooked, but still hold their shape, add the ridge gourd pieces. Also add some turmeric. Taste and add salt at this stage. Cover and cook on medium heat for 15 minutes or until the gourd turns fork tender. Stir in the ground masala from step 4. Check consistency and add a little water , if desired. Stir well to incorporate the flavors. Remove the lid and let this simmer for 5 minutes before removing from fire. Garnish with more cilantro before serving. This looks delicious! And so creative too, definitely keeping it in mind.